Ruysch was a Dutch artist who specialized in still-life paintings of flowers. She was born in The Hague, but moved to Amsterdam at a young age. Her father Frederik Ruysch (1638 – 1731), a famous anatomist and botanist, was appointed a professor there. He gathered a huge collection of rarities in his house. She assisted her father decorating the prepared specimen in a liquor balsamicum with flowers and lace. At fifteen Ruysch was apprenticed to Willem van Aelst (1627 – 1683), a prominent painter from Delft, also known for his flower paintings. In 1693, she married the portrait painter, Juriaen Pool (1666-1745), with whom she had ten children. In 1701 Ruysch was inducted into the painters' guild in The Hague. Several years later Ruysch was invited to Düsseldorf, along with the painters Jan Weenix (1640 – 1719) and Adriaen van der Werff (1659 – 1722), to serve as court painter to Johann Wilhelm, Elector Palatine (1658 – 1716). She remained there from 1708 until the prince's death, after which she returned to Holland where she continued painting for prominent clients. 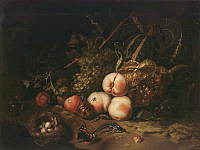 Of her works from this period is the still-life, Fruits and Insects, now in the Uffizi Gallery. Ruysch was also noted for her paintings of detailed and realistic crystal vases. Ruysch lived eighty-five years and her dated works establish that she painted from the time she was a young woman until she was an octogenarian (in her 80s). She is known to have created about a hundred paintings, usually marked by a use of dark backgrounds.